South Reward — St. Maarten Martial Arts Federation (SMMAF) proudly presents its second annual spring competition on Saturday, May 26th, at MPC gym in St. Peters from 12-4pm. This event is unique in that two very different combat martial art forms will be on display – Muay Thai Kickboxing and Brazilian Jiu Jitsu. 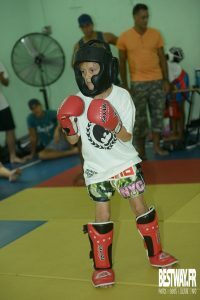 Muay Thai is a dynamic striking art – competitors wear gloves, shin-pads and headgear (although striking to the head is not allowed). Brazilian Jiu Jitsu is a grappling art where competitors win by joint locks, strangulation or in the case of no submission – via positional dominance and control. All matches begin from a standing position, so elements of Judo and wrestling also come into play making it an interesting spectator event. Invitations are extended to all combat martial arts organizations on St Maarten. Registered competitors hail from Marco London’s Sityodtong Foundation, SXM BJJ/Renzo Gracie St. Maarten’s Muay Thai and Brazilian Jiu Jitsu Teams and Saint Barths Jiu Jitsu Team. Despite being a smaller island, Saint Barths has a strong martial arts community. Their kids team even traveled to Atlanta to compete in 2017. The specialized mats for the Jiu Jitsu competition area are generously provided by Aartwicht Bell, President of the Sports Federation and National Judo Association. Official sponsorship is provided by Heavenly Water. Parking is available on the roadside, after the main entrance to MPC school. SMMAF president Marco London will coordinate the Kickboxing matches and Melissa Bardfield, (BJJ Black Belt under Renzo Gracie) will preside over the Brazilian Jiu Jitsu matches. Referees will also include Wesley Hendriks of Windward Roads who completed an IBJJF (International Brazilian Jiu Jitsu Federation) referee course. Due to the highest number of students hailing from SXM BJJ, some students will compete against teammates however all athletes are excited to have this opportunity to demonstrate and test their martial arts skills locally. The focus of the organizers is also to build closer bonds across our small, but talented, island region and build confidence in each and every student. For more information, registration information or sponsorship opportunities please contact Melissa Bardfield via info@sxmbjj.com.